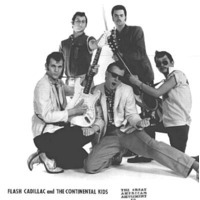 Flash Cadillac and the Continental Kids, now known as Flash Cadillac, are an American retro rock 'n' roll band. They are best known for their portrayal of the group Herbie and the Heartbeats in the film American Graffiti, which they contributed three songs: "At The Hop", "Louie, Louie" and "She's So Fine". Formation, The band began in 1969 in Boulder, Colorado at the University of Colorado with Kris Moe as the keyboardist, Linn Phillips guitar, Warren Knight on bass and Mick "Flash" Manresa as front man and guitar. The band got its name, "Flash Cadillac and the Continental Kids" from Hughey Plumley who spent most of his time in the back of a Boulder bar, The Sink, and who entertained himself by creating names for bands. Kris Moe and Charlie Phillips (Linn's brother) were college roommates, and that is how Kris came to meet Linn and form the band which performed for the first time in February 1969 at a frathouse party. When the original "Flash," the lead singer and several other band members decided to return to school in 1971, Kris Moe, Linn Phillips and Warren Knight decided to replace "Flash" and auditioned and eventually hired Sam McFadin from Widefield Colorado. The band moved to Los Angeles to try and break into the big time. The L.A. house they lived in was called "The Tiltin' Hilton". Rise to prominence, They appeared on American Bandstand - one of the only bands to do so without having released an album. They were offered the job of playing the band Herbie and the Heartbeats in the George Lucas movie, American Graffiti. Later they appeared in an episode of the TV show Happy Days. They also played as the band in the movie Apocalypse Now. The band commissioned surf artist Jim Evans to paint the cover of their 3rd release "Sons Of The Beaches. The band charted in 1976 with "Did You Boogie (With Your Baby)" (Billboard HOT 100 peak #29 in Oct 1976) from their album "Sons of the Beaches". Later years, When they were in their 30s, they dropped "and The Continental Kids" from the Flash Cadillac name as they decided that as 30-year-old men, they should not be called kids anymore. Becoming tired of the Los Angeles music scene, in 1976, the band purchased a large ranch near Westcreek, Colorado where they built a state of the art recording studio. Some of the band members lived there. Kris Moe lived in a geodesic dome on the property for many years. Most of their later albums were produced there. Charlie Phillips now owns the ranch and studio. Most of the original members are long gone. Linn Phillips died of a heart attack when the band came off stage after a show in 1993. Subsequently, Sam McFadin died of a heart attack in 2001 at his home in Colorado Springs, and shortly thereafter Kris Moe died after a long struggle with ALS (Lou Gehrig's disease) in July 2005 at his home in Woodland Park, Colorado. Original bass player Warren Knight and long-time member Dwight Bement on sax still play and tour with additional members as Flash Cadillac.